I picked up the latest Sport the other day and the cover was so good that I didn’t want to open the issue for ages. Sam Duckor-Jones’s drawing is like a poem that is strange, off-kilter, mesmerisingly good (someone is adrift awkwardly in the sky). Just inside there is list of books that Victoria University Press are publishing this year: 8 fiction, 11 poetry, 2 plays/poetry-music, 9 non-fiction. I have been musing lately on VUP’s productiveness and how it is to be utterly lauded. In a tough publishing climate, VUP work hard to showcase New Zealand writing in diverse forms and with diverse preoccupations. I hear niggles (especially when VUP got such a clean sweep at the Book Awards) yet I have no time for such gripes. This is a chance to celebrate a publisher sticking its neck out and publishing quality writing whichever way you look. I don’t see the VUP stable as a set of clones – the exact opposite. On my blog I only have time to review the books I love (and even then I don’t get to them all) and interview poets that have struck a chord at some point. It is very seldom I skip over a VUP poetry book because it has missed the mark for me as a reader. If I look back at books published over the past few years, I see an eclectic mix as opposed to a restrictive school of poetry. Think of the wry wit of James Brown, the breathtaking musicality and heart-stopping moves of Bill Manhire, the grit of Geoff Cochrane, the anarchy and surrealism of Hera Lindsay Bird, the contemplative detail along everyday trails of Jenny Bornholdt, the inventive, unpredictabliity of Hannah Mettner. I have adored this poetry and yes, I will sing its praises from the rafters. In ‘The Old Guard New Guard’ session at AWF17 and in response to Andrew Johnston raising the clone issue, Bill Manhire summed up his aims and ways of working when he was teaching at IIML. The conversation utterly resonated with me and a few things he said corresponded perfectly with my idea for Poetry Shelf’s Winter Season (to be posted in July!). The essential aim was for students to find their own voice (Teju Cole talked about this a little too). I loved this idea: ‘Write what I don’t know but it will somehow be mine.’ In workshops, Bill wanted students ‘to jump the tracks, to go sideways from themselves.’ He wanted them ‘to turn themselves into other poems’ and ‘to produce poems that mattered to them.’ Bill also applied this to himself and talked about the way he might get too comfortable and thus seek out ways to elbow himself sideways off the writing tracks (my words sorry as I didn’t record this). These notions really resonated with me. As poets we are all attached to the mysterious thing called voice: our voice, how to sustain it, how to tilt or transform or nurture it. I love the idea of sidestepping the usual ruts and paths. The latest issue of Sport is chiefly a celebration of writing that has come out of Wellington or is part of the VUP stable. I don’t have an issue with this and I applaud the range and diversity of writing within. There is a fabulous interview (Bill Manhire interviews John Gallas). I now want to track down John’s poetry – the taster of poems confirms he is a poet to add to your shelves. Hope the poetry interview (or of other genres) becomes a regular feature of Sport particularly if it is conducted over months at leisure by email as this one was. Great reading! Also loved the cluster of essays in the middle by John Newton, Virginia Were and Giovanni Tiso. Another essential ingredient that adds verve and challenges. The poets range from James Brown to Frances Samuel ( conjunctional wit produced out of found material to slightly strange, reader-hooked storytelling); from the luminous detail of Elizabeth Smither to the surreally personal and personally surreal of Rata Gordon; from the bolt in the eye of Claire Orchard to the tender detail of Harry Ricketts. One of my favourite new poets, Amy Leigh Wicks, haunts me, as does Bill Nelson, in the unfolding detail and the way the poems move. Good to read Bob Orr sharply conjuring place, Rachel O’Neill’s prose-like agility, Jake Brown’s bright jumpcut portrait of a town, the stark, sharp tug of Natalie Morrison’s fairytale-ing. I haven’t finished reading yet: still Anna Jackson, Vincent O’Sullivan, Jake Arthur, Helen Heath, Kerrin P Sharpe and more. In my bag for today. Ha! A poetry bag! So this seems like the perfect occasion to say congratulations to Fergus Barrowman and his team at VUP. As a writer, reader and commentator on NZ poetry, I am in debt to the extent of your gifts to NZ literature. As for Bill Manhire, I reckon it is about time a poet got the top Honours in a Queen’s Honour’s list along with those who have done extraordinary things in the business world. Bill has gifted so much with generosity and humbleness, he has enhanced what we both read and write, and has written poetry collections that sing like no other. Yes there is magnificent poetry in all its forms accruing the length and breadth of NZ, fabulous poets and poetry projects, tireless ambassadors (Michele Leggott, Bernadette Hall, Emma Neale, David Eggleton) but this is VUP’s year and I applaud you! 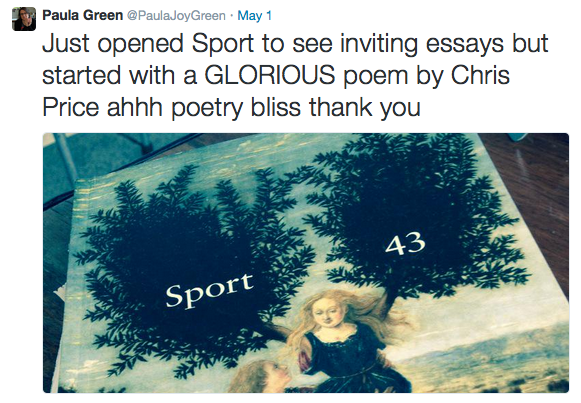 This entry was posted in NZ author, NZ poems, NZ poetry, Uncategorized and tagged Bill Manhire, fergus barrowman, Sport on May 25, 2017 by Paula Green. Sometimes a literary journal is just the ticket for rainy-day blues, diversion, or the need to put a finger on a literary pulse. Ha! The notion of a literary pulse is where debate ensues. Each finger will be sensitive to different nuances, different implications. I strongly believe that national anthologies that claim to represent a wide group ( New Zealand, for example) must be challenged if gender, ethnicity, age or geographic-location biases fuel significant blind spots. For decades, women were the blind spot in anthologies and journals, and now, at times it seems there is token representation of work by Māori, Pasifika and Asian authors. 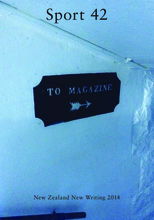 Literary journals, however, are often the bloodline of a place, a niche, a literary disposition, and nearly always reveal the predilections of the editor. Sport comes out of Wellington, and it is to a great degree of Wellington (not in subject matter, but in terms of authors selected). It is a celebration of the writing by both established and emerging writers that have some connection with the city, often through Victoria University or its Press. I have no problem with this. I most definitely have no problem with this when the work included catches my attention and sends me in directions both familiar and unfamiliar. The latest issue worked a treat for my rainy-day blues. Seven essays are sprinkled through the selection of poetry and fiction, and if this is a new feature, it is a feature I applaud in this climate of idea-sharing in creative and stimulating forms. Long may it continue. This time I went to an unfamiliar name first, ‘Ruth Upperton,’ and what a discovery. Think I must have yearning for the comfort and absolute pleasure of poetic musicality (why I like the poems of Michele Leggott and Bill Manhire so much). Ruth has appeared in other journals, has just finished a law degree and lives in Palmerston North. Her five poems are different, the one from the other, but are linked by gorgeous rhyming (off, aslant, sliding), infectious repetitions, aural chords, sumptuous words. There is poetry out of sentences and there is poetry out of curiosity. You shift between comfort and strangeness. Nothing sadder than a lonely river. Nothing darker than a single crow. Shiver at the strong’s surrender. Play a tune on your June piano. James Brown’s terrific poem, ‘Mercy,’ made me hungry for a new James Brown collection. Anna Jackson’s three cooking-show poems suggest she is just getting better and better ( I am working my way through Catallus so I can review her new collection soon). I love the way the ingredients (excuse the pun) in these poems shift and flicker from one poem to the next, and in their new baking dishes taste a little different. The sort of poems that evoke a steady engagement at the level of sound and narrative. Sarah Jane Barnett’s sequence of poems, Addis Ababa,’ caught me by surprise. They take me to an elsewhere, the elsewhere of displacement, of otherness, of immigrants. The poems step up from everything Sarah has previously written, and then take another step into risk, empathy, inquiry, experience. What a combination. Rachel Bush’s ‘Long and short,’ is a poem that moved me with its exquisite detail and revelation, a family story (true or false) that catches in the throat. The poetic glue: the baked bread. when we were less than we desired. Still most essays and fiction to read, but started here: Damien Wilkinson’s lecture/essay navigates a subset of the ‘ought’ and ‘ought not’ of narrative: the way it ought/ ought not represent some kind of personal change (character based). Fascinating following the thread of argument. Is this a requisite ingredient in poetry? That poems ought to navigate some kind of change? I raise this because, and I am shifting tack a little here, I am fond of poems that exhibit some kind of movement (and movement may be zen-like and hold change within its sameness and vice-versa). Poetic movement need not be on a grand, spectacular scale. It might be miniature shivers in the poem, sweet little movements that you catch out of the corner of your eye, or a flicker in your ear, or a faint tremble of your heart, or the tug of an idea that is itching to confound, challenge and pull you elsewhere. That is what I felt when I read, ‘She cannot work,’ Ashleigh Young’s foray into fiction. It is what I felt reading this issue of Sport, a catalogue of movements that displaced my state of fatigue. Sport: miniature shivers in the writing, sweet little movements that you catch out of the corner of your eye, or a flicker in your ear, or a faint tremble of your heart, or the tug of an idea that is itching to confound, challenge and pull you elsewhere. This entry was posted in NZ poetry, NZ poetry book, NZ poetry journal, nz poetry review, NZ Poets and tagged Anna Jackson, Ashleigh Young, Chris Price, Damien Wilkins, Rachel Bush, Ruth Upperton, Sarah Jane Barnett, Sport on May 12, 2015 by Paula Green.